This study looks at the influence of ideas and think tanks in Britain, contemplating how ideas have shaped politics and society. The purveyors of ideas for change - the think tanks - are examined, and academics and participants vieww are recorded in a number of interviews. Political Ideas since 1945, Or How Long was the Twentieth Century? deficit in the National Insurance Fund. Consequently, when the scheme came into operation in April 1961, many of those eligible to join chose to contract out. As Hannah comments: As the insurance world recognised, Boyd-Carpenter's plan was 'a political gimmick not a pension scheme'. Nonetheless, as it left them a relatively clear field, the main pension interests understandably supported it.... The Conservative strategy had been to achieve as little for the state scheme as politically possible; and if the primary measure of success is the consonance of objectives and achievements, their graduated pension scheme must rank as the most successful piece of pension legislation ever. The plan achieved little in the way of Earnings-Related State Pension, and did so at considerable cost. The proliferation of quangos to regulate these industries (and many public services) was preferred to the introduction of greater competition. The ASI originally claimed a pivotal role in the gestation of the Community Charge, since an article on the subject had appeared under the name of its director, Madsen Pirie, in October 1981. 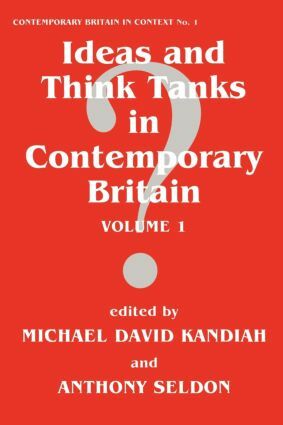 However, this has been disputed by recent research (although it is interesting how many individuals who had once been associated with 'think tanks' took part in the planning of this measure). tanks have none the less demonstrated some clout. The intellectual climate has changed in their favour and their efforts have showed some figures on the centre-left how best they may follow their example." The changed political circumstances of the 1980s gave these think tanks the space in which to pursue their ideas. Only when conventional thinking has been breached and some form of new paradigm established can practical ideas to enact policy in line with the new paradigm be successfully advanced. It becomes easier to demonstrate the chosen method in which a practical problem can be tackled. To return to the analogy of 'pushing at a series of doors', the Adam Smith Institute found it easier to push at a half open door than one which was firmly shut. The rise of neo-liberalism (and economic liberalism in general) and the abandonment (in practice if not yet in theory) of full employment policies in the 1970s was not based on the force of the intellectual arguments of the New Right. It was a product of a new demand for ideas within the Conservative Party that reflected the socio-economic predicament of the United Kingdom during the 1960s and 1970s. The Thatcher-led Conservatives were simultaneously a receptive audience and the champion of those ideas promoted by a neo-liberal political community which numbered within its ranks think tanks such as the Adam Smith Institute: Where that government and its successor led, out-riding conservative think tanks followed.